Full time job? Currently working on my books. I also do graphic design. Who is your favorite author and book? Favorite author would be Ernest Hemingway. Favorite book is The Sun Also Rises. How did you start this journey to become a writer? A poetry contest I entered back in the 1990’s. What have you written so far? Up to now I have written three of the books in my Halcyon series which I am reworking, along with several short stories and poems. Tell us about your current book. 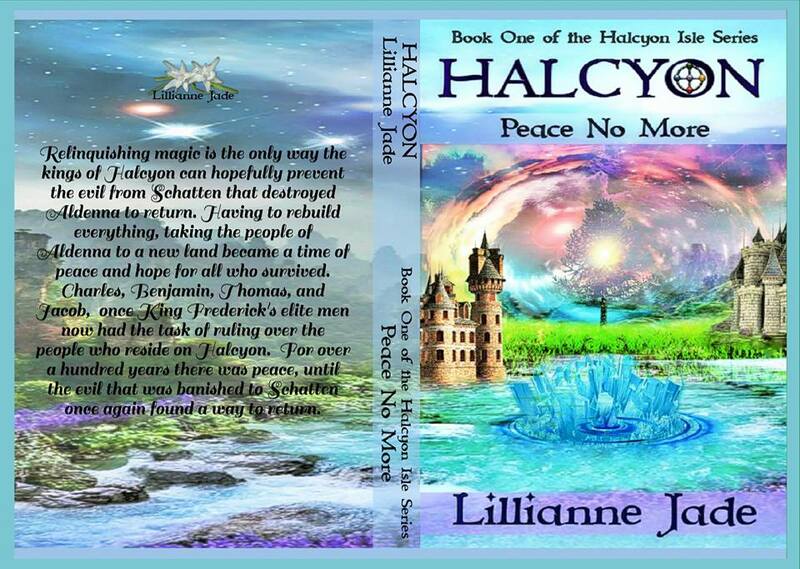 Halcyon, Peace No More is the first book of five in my Halcyon Isle Series. In this book one you will learn of the tragedies and trials that must be done in order to banish the evil that once took over Aldenna. Having to decide to relinquish any form of magic, so that what occurred on Aldenna would not on Halcyon. The evil will return over a century later and the kings and queens of this time have to take on the great tasks of getting their powers back from the elemental spirits. In order to do so they have to show great reasoning for wanting theirs and their people’s magic returned to them, and would have to abide by the laws on how to do this that were created by their ancestors, the founders of Halcyon. What is the inspiration for your current book? My love of fantasy, dragons, anything mystical definitely inspired my current book and the Halcyon Isle Series as well. Who was your favorite character to write and why? Queen Helena Sterling, wife of King Peter Sterling of Cyan on Halcyon is my favorite character. Helena throughout book one Peace No More shows much strength and courage, she is the strongest character of all the queens. Is there anything of you in that character? Of me? No. Queen Helena is named and created from my Oma (grandmother). A lot of my own strength I pull from my memories of my Oma, Oma lived through WWII Germany as one of the many who rebelled against the Nazi Regime. During this time she helped to house and free many Jewish citizens, giving one woman her own identification and passport in order for the woman to take herself and her children over the borders to safety. Oma was also arrested and placed into a concentration camp with some of the Jewish citizens she was trying to save. Fortunately she was set free, having two children, my uncle and my mother, who might have not been born. If Oma was not set free, my mother would not have been born and I would not be here today. Also during the time of WWII, Oma fell in love with my Opa (grandfather), who was an African American soldier in Germany at the time. He took in my mother and uncle as his own and years later after the war was over he sent for them to come to America in 1951. As anyone knows interracial marriages were greatly frowned upon at this time, Oma, however did not care, she held her head high and did not allow anyone to tell her what she should do. What sets your book apart? I write outside of the box, create my own creatures, and hope to have written a book that does not have elements of other books. What’s your favorite part in the book? This is a difficult question to answer, as the author of my books how to I chose one part? But if I have to choose I would have to say Chapter 2, Relinquishing Magic. What was the most difficult part to write? The most difficult part to write has nothing to do with how long it took me to write, rather the emotion of the characters involved. Patrick Randolffe, son of King Dominick of Indigo on Cyan had to make the difficult decision of taking of the throne and throwing his own father into solitude after Dominick goes insane from a spiraling downhill depression from unfortunate events. What was your favorite book to write? I love my entire Halcyon Isle Series, and have not completed the fourth and fifth books yet, so I cannot answer this at the moment. How do you write? Do you have a set time or place? How many hours a day? I write in my room, I do not set a time frame, I write when inspired. Why did you want to be a writer? I have always had a passion for writing, I never thought I would be any good at it. Until I submitted my poem Our World to a poetry contest after 911. My poem was awarded in the top ten. How do you get your ideas? My ideas for my book(s) come randomly to me, there is not any rhyme or reason. What do you have planned next? While I am still working on the Halcyon Isle Series, my next book will be one I am working on with a fellow author. This book will be compiled of poetry and short stories. What advice would you give new writers? I would tell new authors to stay focused on what they want to achieve with their writing and not to be discouraged. Do not set yourself a time frame as to when a book will be completed just because you may see other authors putting out more books. This is your book, your creation, you have to make sure every last detail is exactly as you want it to be. How can readers get in touch with you? I can be reached at my email lilliannejade@gmail.com or on twitter @LillianneJade.